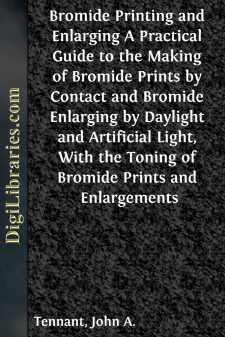 What is bromide paper? It is simply paper coated with gelatino-bromide of silver emulsion, similar to that which, when coated on glass or other transparent support, forms the familiar dry-plate or film used in negative-making. The emulsion used in making bromide paper, however, is less rapid (less sensitive) than that used in the manufacture of plates or films of ordinary rapidity; hence bromide paper may be manipulated with more abundant light than would be safe with plates. It is used for making prints by contact with a negative in the ordinary printing frame, and as the simplest means for obtaining enlarged prints from small negatives. Sometimes bromide paper is spoken of as a development paper, because the picture-image does not print out during exposure, but requires to be developed, as in negative-making. The preparation of the paper is beyond the skill and equipment of the average photographer, but it may be readily obtained from dealers in photographic supplies. What are the practical advantages of bromide paper? In the first place, it renders the photographer independent of daylight and weather as far as making prints is concerned. It has excellent “keeping” qualities, i.e., it does not spoil or deteriorate as readily as other printing papers, even when stored without special care or precaution. Its manipulation is extremely simple, and closely resembles the development of a negative. It does not require a special sort of negative, but is adapted to give good prints from negatives widely different in quality. It is obtainable in any desired size, and with a great variety of surfaces, from extreme gloss to that of rough drawing paper. It offers great latitude in exposure and development, and yields, even in the hands of the novice, a greater percentage of good prints than any other printing paper in the market. It offers a range of tone from deepest black to the most delicate of platinotype grays, which may be modified to give a fair variety of color effects where this is desirable. It affords a simple means of making enlargements without the necessity of an enlarged negative. It gives us a ready means of producing many prints in a very short time, or, if desired, we may make a proof or enlargement from the negative fresh from the washing tray. And, finally, if we do our work faithfully and well, it will give us permanent prints.